You could be forgiven for wondering if Ralph was still alive - given the fact I've not updated his blog in more than six months. Whoops! In that time I've had some drafts in the making, time and again, which I was almost ready to post, but never quite got around to it. One of the last posts I was working on was saying that nothing much has happened - apart from a few trips to the ER, but since that un-posted draft, Ralph has, in fact, passed. To say that I didn't see it coming is a bit of an understatement. I mean, OK, he was on hospice to be fair, so it wasn't an out and out shock,...but on that Sunday afternoon when he passed, I honestly didn't see it coming. I guess in some ways that's probably better and maybe even how he'd have wanted it. We'd had a good few days prior to his departure. Trips to the Dollar Store and Costco (his faves). Time spent feeding his many squirrels. He received a Christmas card from his sister Dianne which contained a hundred dollars and he was over the moon about that. We celebrated Christmas with the family two nights prior. Basically we just enjoyed some simple quality time. On the Sunday afternoon, when I returned from a family trip to see Santa, and Ralph didn't look good. He was shivering all over. His body was shaking like a leaf and I thought "he needs to go to the hospital". When a person is on hospice, you don't just call 911. You have to call hospice first. I did and was told they could not come until 5pm. I wasn't happy but shrugged it off and figured he'd be ok for a couple of hours. He wanted to go to bed so we got him there. He walked to his room slowly, a bit wobbly, but fine. Wendy arrived with partner Rich and we all fussed a bit over him. As she had a full house of family (it was 2 days before Christmas, remember), Wendy and Rich returned to her home - with the plan that she'd come back in an hour when the hospice nurse was there. In my blissful ignorance, I simply thought we'd be taking him to the hospital. I needed to shower and wash my hair. I didn't take long and then returned to dad, massaging his feet, and feeling helpless. "I need a pee" he said to me after a while. This was about the third time in an hour or two he needed to go. It seemed odd as he wasn't drinking that much, but I helped him into the bathroom as he did his business. Got him sorted back in bed and he looked as though he was resting, but not comfortably. At one point he was struggling for air, so I tried to lean him over toward his knees to help him breathe. Then, he was a bit of a rag doll, so I put him back into his sleeping upright position, and I watched his eyes go into the back of his head. He'd already taken his last breath. Are you gone? I repeated - interspersing with "I love you". As soon as it happened, I reached for the phone to call Wendy and the hospice nurse. It was 4:50 and both were en route. "I think he's gone" I said to them each. I had never seen a dead body so I wasn't sure but his chest was not moving and his mouth was wide open. Apparently I had text my friend Kim to simply say, "He died". She immediately video called on WhatsApp. I answered. I confirmed that yes, he was gone, and apparently even showed her the body over my shoulder! Kim said she heard my sister arrived, crying, just as I hung up on her. To be honest, I have no recollection of that conversation ever taking place. It wasn't until she told me over a week later that we spoke. So who can tell for sure if dad's ultimate departure went exactly as I describe here. What I do sort of remember is that I was calm, and didn't really cry too much. He wouldn't have wanted that anyway. I was level-headed as the hospice nurse described what to do next. She needed fresh clothes to put him into. It was her job to make him look presentable, as he headed off to be cremated. She gave Wendy a number call to collect the body. 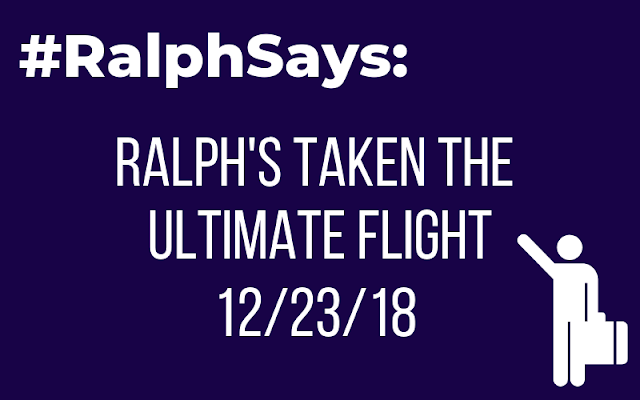 It would be a few hours before they would come and take Ralph away. For most of that time, prior to him being hauled off, I just sat beside him, my hand on his arm. I didn't want to let go as I knew it was the last time I'd ever touch him again. A few hours later Ralph was taken away by two gentlemen from a local crematorium. I couldn't watch any of that. For me Ralph will live on through Ralph Says Things. 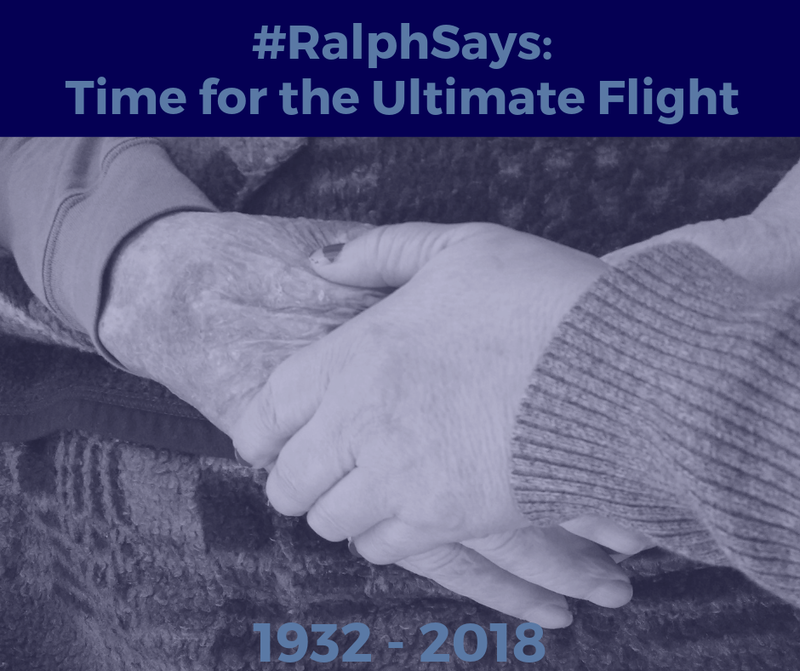 Will my best to keep this blog going, but each week, the best place to see Ralph's legacy and words of wisdom will be on his Facebook page and Instagram. Join me there if you're interested. PPS: I've been a lot better at keeping the Ralph Says Things Facebook page up to date, and to some degree the Instagram profile too. Feel free to connect on there. Or visit the Ralph Says Things shop.